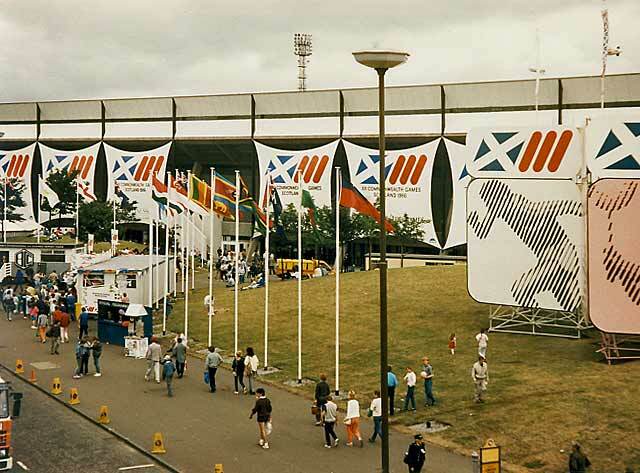 The Ninth British Commonwealth Games was almost certainly the best athletics event ever held in Scotland: I await the Glasgow Games in 2014 with interest. Several of the best ever races are still remembered -from Lachie’s 10000 metres on the opening night and the Ian Stewart/Ian McCafferty duel on the final afternoon, it was an altogether wonderful Games. Some of the memories and successes should really be recorded and not forgotten. The lay out here will be, facts and figures on this page, results, reports, personal memories and everything else to be accessed from the Navigation Bar which will be at the bottom of the page. This will be in place in a couple of days. Countries and Competitors on this page first. First, the countries taking part. It is thought by some that the Commonwealths is a small event – maybe in comparison to the Olympics but ‘small’ is not the word. Forty four countries received invitations from Scotland as the host country. Of these, two did not send a team: British Honduras and Brunei. This Games logo was the first ever logo designed for a Commonwealth Games, it was the first Games to be designated the Commonwealth Games (previously the Empire Games), the first time metric units were used rather than Imperial and the first time they had been held in Scotland. They had been awarded to Scotland at the Olympics in Tokyo in 1964 where Scotland got 18 votes and Christchurch, New Zealand, got 11. The athletics party of 58 had only four non-competitors each of whom was an essential part of the team. An athlete:official ratio of 53:4 is remarkable by present day standards. The total number of athletes taking part was 545, made up of 408 men and 137 women. There were no women entered from Antigua, Barbados, Bermuda, Dominica, Fiji, Grenada, Guernsey, Guyana, Hong Kong, India, Jersey, Kenya, Malawi, Malaysia, Malta, Isle of Man, Pakistan, Papua and New Guinea, St Lucia or St Vincent. It was also in total the biggest number of athletes ever to contest the Empire/Commonwealth Games: 386 more individuals and seven more countries than Cardiff in 1958. Edinburgh 1970 had more countries sending more athletes than ever before. The venues were built in good time with some assistance from the Government. The various sports sent ticket application forms to their constituent members before they went on sale to the public and some sessions had lower rates for school parties and for other groups such as wheelchair users. The Scottish team was comprehensive – no officials saying that no athlete ‘would be taken along for the ride.’ Thn squad was really athlete-heavy and non-competitors light. Everyone in Scotland knew someone, or knew of some one local who was in the team. It was bound to be a popular event.